In any case, the difference in illuminated field size between the 1.83" abd 2" is not huge.. about 0.1" off-axis for both the fully illuminated and the 70% illuminated zone. I ran the numbers thru NEWT and I'm getting different results that what you've stated for some reason. With a 1.83" secondary, I'm getting a field diameter of 1.18" at 75% illumination and 0.44" at 100% illumination. With a 2.14" secondary, the numbers are 1.52" and 0.80" respectively. So, it appears to me that there is a substantial difference between the two secondary sizes as far as field illumination is concerned. I have a 2.14" secondary on my 10" f/6, which is preferable to me because I enjoy deepsky wide field observing as well as planetary observing and am using at least one 2" eyepiece. The 2.14" secondary yields a CO of 21.4% which seems very acceptable to me. I've looked at a number of designs in NEWT and concluded that unless you don't care about edge illumination at all, it is pretty difficult to design a Newtonian with a really small secondary, at least in a smaller aperture scope with an f/ratio less than f/8. I think the difference you and I get are attributed to two factors. 1. I was comparing a 1.83" with a 2" not a 2.14 inch. 2. I was look at how far off axis the fields were at 70% and 100% illumination.. so we have to multiply those results by 2 for them to be directly comperable. Other differences can be accounted for different assumptions about the outside tube diameter and the focuser height. He used 1.83" and 2.00", you are using 1.83 and 2.14, which is almost twice as much difference (0.17" vs. 0.31"). Granted, 2.14" is the commonly available size. Also, it is worth noting that the light falls off much more steeply in slow scopes - the distance between the 100% zone and 75% of an f8 is much less than that of an f4. So, while you can design a slow scope with a pretty large 100% zone (ideal for planet observation), it may still show visual vignetting towards the edges at low powers since the light falls off so rapidly. While a faster scope will have a smaller 100% zone, the slow dropoff means that it's 75% zone will be wider, and probably will not show visual vignetting near the edges (in fact, it is possible in larger, faster scopes to have almost no 100% zone and still have the 75% zone wider than the 2" focuser....). 5.) This is my favorite part. Go to a good observing site where there's some laminar air flow and stable temperatures"
I agree - the air can be pretty steady then, but it doesn't last long. It's almost a tease. If this weather continues, we may be looking at some good prices on used equipment! Alan, no don't buy it.. if people start buying telescopes the bad weather will never end. Hmmm... has anyone ever studied and cataloged the distinctions & statistical correlations between NEW and USED astro-equipment purchases & subsequent weather patterns? It could just be that, if properly planned & executed, we could all arrange to buy each other's *used* equipment in synchronous fashion... thereby faking the weather out. Of course, if not carefull, or details are overlooked, we could incite a compounding weather effect where our synchronicity might superpose to create a global catastrophe! Anyone remember how to build an ark? My goodness this thread just keeps going like the energizer bunny.. I have read and enjoyed it greatly. I just had one terrific night (6.5 magnitude) with the new big refractor. Was observing with two of my club members who had there 18" and 20" Obsessions. Also the guy with the 18" set up his Meade 8" SCT. The comparing views between the 8" refractor and 8" SCT were quite obvious in the refractors favor (wasn't close) on any DSO. The refractor also compared pretty well to the much larger scopes in that though the bigger scopes showed brighter images, the refractor's image was much clearer and lots more contrast. Much of the detail for instance in Ngc-4631 with it's companion Ngc-4627 and the other large galaxy Ngc-4656 seen in the 18" at similar magnification (164x), was seen in the 8" refractor. The owners of the 18" and 20" were much impressed. I'm not saying the refractor was better or as good then either of the much larger scopes. What I am saying is a large refractor is a great tool for deep sky observing, and not just a great planetary scope. My full report of this terrific night will be soon. Man, I love big scopes in both types (reflector-refractor)! What I am saying is a large refractor is a great tool for deep sky observing, and not just a great planetary scope. Ok, I admit it I’m mildly crazy and (perhaps as a result) like refractors - I just do ok. And the voices tell me to post this so here goes. The reason refractors beat reflectors in some applications is physics and maths. I like to use 2inch eyepieces because they give the widest possible fields with a 7mm exit pupil etc. etc. If I'm going to do that with a reflector I need a secondary obstruction of about 65mm - that's just the maths. Anything smaller wastes most of the light. With 4" of aperture this is a total disaster. With 8" it’s merely unfortunate and with 12" it's of little consequence. See the pic, which hopefully is attached. So, all things being equal (which they seldom are) a 4 to 8" refractor will beat an equally good reflector of similar aperture. Once you get to big apertures the refractor advantage fades away rapidly. Given that on any typical night seeing limits resolution to about 0.7 to 1 arc seconds, if you're looking at bright things like the moon or planets a small portable refractor wins. And if you live in the burbs like me, a 18 "light bucket dob will give you enough sky glow to read your star chart by! Now of course on a mountaintop in Chile the 18" dob will kill the little 6" refractor - but I ain't in Chile Tonto! Refractors do cost a lot more, sure as eggs they do. But a Jaguar costs a lot more than a Skoda. You could have a dozen Skodas for the price of a Jag and they would both get you to work. At the end of the day like so many people say, it's the scope you use a lot that's the right one for you. The error in your assumption is that the secondary would have to be the same size in all those different apertures. But, because the secondary to focus distance also reduces as the aperture decreases, the actual secondary size, to illuminate the exactly same-sized focal plane, would reduce in the smaller aperture, in actual dimensions. 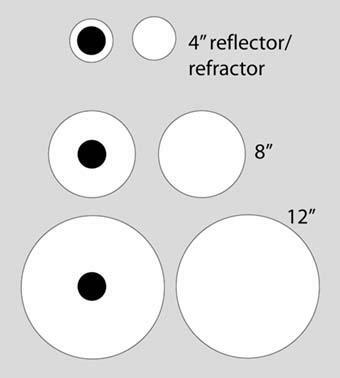 What IS true is that the percentage of obscuration in the smaller scope would be larger, so the small reflector is more at a disadvantage for illumination of a large focal plane (as in two inch eyepieces). So, your drawing should have shown decreasing shadow sizes as the aperture reduced. A little play with a secondary calculator (like Mel Bartels') shows the advantage of larger scopes, in terms of secondary size. By the time you get to about 12.5", a 70% illumination at the edge of the field only requires a secondary of about 20%, and that percentage decreases as the aperture increases (assuming normal f/ratios, not something odd like f/2.9 or f/10). Comparing a refractor to a reflector is comparing apples to oranges. For a very interesting read on a cloudy night, I highly recommend "The Botany of Desire: A Plant's-Eye View of the World," by Michael Pollan - especially Chapter 1, which is about apples. Thank you for the laugh! Cheers! You're welcome. And it is really worth reading. I found apples absolutely fascinating. Your teachers all lied to you about Johnny Appleseed. My 6" refractor will show the arms of M51 from a dark site, but fairly subtly. It's far behind what my 10" Dob can do in that area. The inability of the refractor to show much spiral detail in galaxies is probably its greatest drawback as a deep sky instrument. Yeah..but for that gorgeous refractor of yours with a good CCD camera, etc., you're bound to get GREAT astroimages. I think someone said each instrument has its strengths. I don't consider it a contest by any means. I have what I can currently afford. I'm happy with what I use and wish everyone all the same happiness with what they use. Mosaic ... when to do within PixInsight flow?